If you’ve never done it before, painting wood seems like an incredibly easy task. Simply pick your favorite option and then brush it on, right? Wrong! 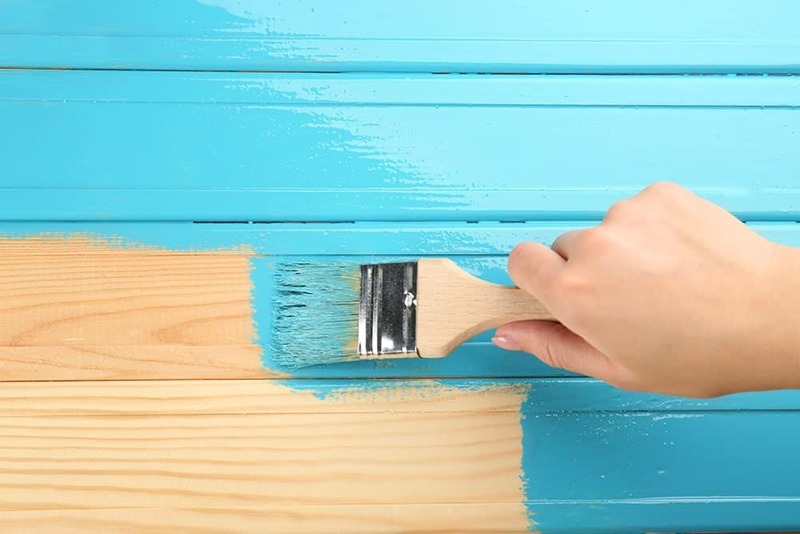 Before applying any paint to a wood project, you’ll likely need to clean the surface, strip and sand it. After that, the priming is recommended. Much of the process described above depends on whether the wood is already primed and painted or raw. If that seems like too much work, don’t worry. There are many new paints on the market that allow you to skip these steps by including them in one simple process. There are also so many styles and finishes you can choose from, from a matte or glossy finish to a velvety chalkboard style surface! In this article, we’ll explore 10 best paints for wood that are currently on the market. If you are looking to easily refinish wooden furniture, cabinets or old trim but don’t know where to start, Renaissance’s Chalk Finish is a great option for you. There’s absolutely no sanding or priming required; you just simply paint on the color that you like the most. The recent trend to paint vintage furniture produces beautiful pieces but is quite a bit of work. This acrylic product with a smooth finish will help you achieve the same results without having to hire a professional. The paint has superior coverage with a unique chalky finish that adds to the vintage style. Plus, you only need one to two coats to achieve maximum results. This option comes in 40+ different colors. However, if you need a very specific color, you can order a can that is custom-tinted to match colors from brands like Benjamin Moore, Valspar and Sherwin Williams. The paint dries in less than 30 minutes, so your repainting project could take less than an hour! Speaking of projects, it can be used on nearly everything, from a distressed vintage desk to a sleek and modern cabinet door. I personally used the Renaissance chalk paint to give furniture the shabby vintage look. This option has a lot of colors but I choose shades of white because I think they have the greatest visual effect. I apply it with a soft brush since I really find it easy to use and it gives a really lovely smooth finish. As you will be painting you’ll notice even though the paint’s thin that there aren’t any drips. That’s a really key feature of chalk paints. After top dries, you will be ready to put the next coat on your furniture. It takes about 20 minutes for the paint to dry but it obviously depends on your environment how quickly your surface will dry. The coverage is really good, it’s better if you apply two coats of the Renaissance to get a lovely and smooth look. Even if your wood furniture is already painted, you can paint your favorite style of Renaissance’s Chalk Finish right over it! If you want to get a shabby vintage look you have to slightly distress some of the edges of your painted furniture by using sandpaper. The next step is sanding the surface to make it much more smooth, don’t forget to wipe off all the excess dust at the end of the process. Now if you’re going to use the project outside then I highly recommend you to seal your wood to protect it against the moisture and weather. Check out wood sealers to choose the right one for you. I guarantee you will be really pleased with the final effect. Another great product by Kilz, specifically geared at painting wooden porch and patio floors that easily get worn out. If you haven’t painted your porch or patio floor for fear of the incredible amount of maintenance, you’re missing out on the added style and protection that painting the floor can give you. If you have invested the money to make a beautiful outside extension of your home, you need to protect your investment with this product. Kilz’ Porch and Patio Floor paint protects your wood flooring from scuffs, scratches, fading, cracking or peeling. While it can be applied to any hard surface like cement, metal or masonry, the true beauty of this product is seen when painted on wood. This latex enamel product is really easy to apply. It dries within one hour (however, wait 4-6 hours to apply a second coat) and is available in the popular slate gray or silver gray colors. One gallon covers between 200-400 square feet and can be rolled, brushed or sprayed on to your porch or patio flooring. Keep in mind, any painted surface can get slippery when wet. So if it rains, proceed with more caution than normal, and do not use it anywhere a motorized vehicle would be traveling. If you’re looking for an exterior paint that will protect your outdoor wood project from the elements for a long time, then Kilz Exterior Siding, Fence & Barn paint is the right choice for you! Kilz brand has been a top producer of paints and primers for 40 years. They know what they’re doing, and they do it right! This product is specifically formulated to protect against wear and tear, mold and mildew, rust and more. It resists cracking, drying, peeling and blisters caused by the sun on your outdoor painted wood. It is self-priming, which means you just have to clean and sand down the wood before you apply this product. The water and oil-based formula sticks well to almost anything and lasts for long. You won’t have to reapply year after year, even in the toughest of conditions. Use this on stucco, cement, wood, metal or whatever surface you have outside that needs some protection. The product’s application does take more time than other paints, however. Expect it to dry in about 2-3 hours’ time. Do not apply a second coat until 6-8 hours have passed for optimal results. While it can be brushed, rolled or sprayed on, you also need to be careful in your application, always doing a back-brush or back-roll when applying. This trendy, high-performance paint was created specifically with one goal in mind: to provide you with the best coverage for your cabinets. Nuvo Cabinet paint is a water-based acrylic option that is safe, VOC free and low odor. One can covers a huge amount of cabinetry; nearly 50 square feet or 20 linear feet of cabinetry! It comes in 10 of the hottest colors for cabinets. I do advise that you test it out before coloring every cabinet. The company warns that some colors, like their coconut espresso (billed as a creamy beige) can appear darker or lighter depending on the lighting that you use in your home. It dries with a lovely, soft satin finish that is perfect for use on high-traffic areas, like your cabinets or baseboards or trim. Unlike some of the other product on our list that require no prep work before application, you’ll want to make sure that you do prepare the wood on your project or cabinets before you paint the Nuvo Cabinet on. The company says you don’t have to completely remove any finish that remains on your old cabinets. Instead, you should make sure that the cabinets are de-glossed or sanded down before applying this product. Pay special attention to the areas around door handles or cabinets that are near your stove. They can collect extra grease and should be sanded down until that grease is gone. If the cabinets that you are repainting have a high gloss finish, use a liquid de-glosser first, then sand it down. Rust-Oleum has a reputation for creating durable paints that are high quality and their Matte Interior Chalked is no exception. This option has a velvet-like, smooth matte finish that will transform your old interior wood furniture into new treasured pieces. The great part is, this option works extremely well on a number of interior surfaces, not just wood. You can use it on glass, ceramic, metal and canvas. The paint offers a great opportunity for you to customize your project. After painting it on, you can distress the surface to give your furniture or project a distressed look. You can also put on another layer in a different color to create a multi-dimensional, totally unique look. Minimal prep is needed to get your piece ready to be painted. You’ll be pleased with how well this covers the surface of your project. It’s also available in spray cans if you’d prefer to use them. I have an experience of using Rust-Oleum Chalked Paint to brighten up my dark grey dresser. The first coat was just very thin so that it appeared, but after the second coat it was looking amazing. After that I needed to sand a little bit in a few areas right along the edge where the paint got a bit too thick since I didn’t spread it out enough but that’s was my fault. This paint’s serenity blue color really brightened up the dresser and made it look so much bigger than it looked before with the dark grey color. It was a quick and easy project so overall I was happy with how this project turned out and with my first experience of this Rust-Oleum Chalked Paint. This option is incredibly easy to use. In fact, Rust-Oleum boasts that you can finish most projects in just one coat! It also dries very fast, so instead of your project taking days, it takes just hours. You don’t need to sand down your project before painting but should if there are loose chunks of paint. If you’re painting raw wood, it will work better if you apply primer first, though it is not required. If you do use primer, make sure you wait at least two hours or until the primer is fully dried before applying the Rust-Oleum. It’s very easy to use, just start painting. You will still see through the first coat if your wood was painted dark before but the second coat will go on perfect. There will be no need for the 3rd one. I love the matte finish and so overall I have only great things to say about this option, it’s really a great product. You know it’s some super simple to do but it really changed the entire atmosphere of my bedroom and as I said it made it seem so much bigger. Definitely, I can say that I was super happy with this product and I would recommend it to anybody I know who wants to color their wooden project and get great results. Rust-Oleum’s Painter’s Touch latex-based paint is extremely versatile, with many possible uses both indoor and outdoor. If you’re in the midst of a massive renovation or just working on multiple projects both in and outside of your home, Rust-Oleum makes painting much easier by offering a product that works in both locations. Plus, the beautiful glossy finish can be used on much more than just wood. You can use it on glass, metal, ceramic, plaster and canvas (so long as they are not walking surfaces). Painter’s Touch is made with “double cover” technology. This means you’ll deal with less wear and tear and chipping of the paint. It provides a fresh, clean look to worn-out surfaces and most projects are completed in one to two coats. It’s also a low-odor, safe product that’s easily cleaned up with soap and water should any messes occur during its application. Before using this product on your indoor or outdoor wood project, you’ll want to make sure you sand the item down with a 180-200 grit piece of sandpaper to ensure the best application. If you’re applying it to another hard surface, like metal, it does not need to be sanded down. Additionally, this formula is incredibly fast-drying. You can apply one coat and come back and repaint another in just 30 minutes! Rust-Oleum has a number of paints on this list, and it is for good reason. They put out such a high-quality product, and it’s not just limited to traditional paint. This Painter’s Touch Ultra Cover spray is a fantastic choice if you need quick, even application of color on items that would be difficult to evenly cover with paint due to their size or intricacies. It can be used on nearly all indoor and outdoor pieces, adhering to everything from wood, to metal, ceramic and even plastic! The oil-based formula sprays on evenly and dries very quickly, within 20 minutes or less. This enables you to quickly see the level of coverage from one coat and finish your project quickly, anticipating how many more coats you will need within just minutes. Unlike other sprays, it is low odor and has a beautiful satin finish that will create a look similar to that of what a professional painter would create. This product is both a paint and primer, so you do not need to apply anything to the wood prior to spraying on the Ultra Cover. However, it is in your best interest to sand down any wood project that you are applying it to for better adhesion. This product is also popular amongst car enthusiasts as the clear coat can repair headlights that have turned cloudy with age. If you are using the paint for that, you should also sand down the headlights somewhat before application. This multi-purpose latex paint has a ton of benefits, besides the trusted Rust-Oleum name behind it! It’s great for all of your interior and exterior painting needs. It offers a beautiful satin finish that does not chip easily and works well in high traffic areas. The paint can be used on a wide variety of surfaces besides wood, like metal, ceramics or earthenware, plaster and cement. Unlike a lot of paints, the Painter’s Touch Satin is low-odor. It’s really easy to use and very easy to clean up. You just have to wipe it down with soap and wet washrag before it dries. This one not only goes on thoroughly and evenly, but because it is a satin finish it also hides any imperfections; you need not worry about being an expert when using this product! Prior to using this paint, you should sand down your wood project with a 180-200 grit piece of sandpaper and then apply a degreaser. After that, wait about 2 hours (or more) for the wood to be dry and then apply this paint. While it does take a bit more time and effort than other paints, the final result will stun you! One thing to note about this product is what a fantastic value it is. It costs less than half of some other varieties and one can covers more than 120 square feet! 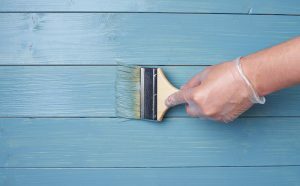 You’ll also end up getting your project done in less time, as it takes just about 30 minutes for one coat to fully dry, and you’ll likely only need one to two coats. This ultra-premium paint from Prestige Paints makes your wood project much easier to complete by combining a paint and primer in one product. Prestige also offers a match to some Sherwin-Williams paints making it easy for you to touch-up old projects and give them new life! Application of this option is extremely easy. The formula’s smooth finish provides even coverage and hides blemishes or mistakes made by the most novice of painters. It also does a fantastic job on wood, cement, stone works, masonry, metal and even vinyl siding! 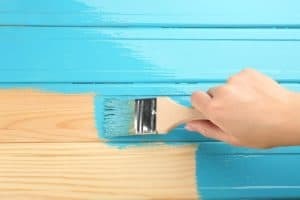 The paint will look great when applied with a high-quality brush, and usually, at least two to three coats are needed to achieve the best look. It usually takes about 2-3 hours for one coat to dry, so this product might take longer to use than others. For best use, any glossy areas must be sanded down and though it this product appears to have primer and paint all wrapped in one can, you do need to apply an initial primer if the wood you’re using on your project is raw. Each color is intended for interior or exterior use only. Read carefully before purchase. Montage a very versatile water-based paint that comes in several versions. You can get a low-sheen version if you prefer a smooth, flat finish, or you can get the semi-gloss variety if you want the wood to shine a little. This paint is available in a bunch of different colors, but all of them are light pastel shades. This presents a slight problem for those who don’t like pastel colors, but their muted nature does make them an ideal choice for home decor. After all, you don’t want your home decked out in a loud color like neon green or hot pink. This is an eco-friendly paint, which makes one feel good about supporting the company with your business. After all, they are not under any legal obligation to produce eco-friendly paint, though there is an obvious marketability incentive to do so. Still, environmental protection is very important, and this also makes the paint much less vile on the senses. One of the more unusual features of this product is a ten-year warranty. I say that it is unusual because most paint doesn’t come with any kind of warranty, let alone a warranty with such a long term. This indicates that the company is very confident in the durability of their product. This paint applies very smoothly, having no real tendency to chunk up and form clumps. If there’s one thing I cannot stand, it’s finding clumps in the paint. You will get pretty good coverage out of a single can of this stuff, and the thick consistency should do an excellent job of hiding whatever it is that you are painting over. Another good thing is that this paint contains substances that are meant to fight mold and mildew. This makes it great for wood in wetter areas that would normally be quite prone to mold/mildew issues. If this paint resists mold and mildew as well as advertised, it wouldn’t be a bad choice for your next bathroom job. This is a lovely pastel paint from the people at New York Botanical Gardens. This is not just one kind of paint, but an entire line of paints designed around a tropical theme. A wide variety of colors are offered, such as “Bird Of Paradise,” “Lagoon,” and “Caribbean Blue.” Obviously, this line of paint isn’t necessarily a good choice for those who don’t like a tropical theme, or for those who have chosen a dark-colored theme for their home or place of business. One of the best things about this paint is the fact that it is also a primer. This line of paint includes both paint and primer in one can. Depending on the size of your painting job, this can save you quite a few hours of work. If you are hiring contractors to paint your home, paint like this will mean fewer work hours, which means a lower bill for you when it’s all said and done. This paint is advertised as containing a new “high hide” formula. Upon doing a little more research, I see that this kind of paint is intended to do a better job of hiding whatever color or surface lies beneath. When you are painting wood, this might be a good thing or a bad thing. If you want to preserve the woodgrain to any extent, this might not be your best choice. However, those who wish to preserve the grain of a wooden surface should use a stain and/or shellac rather than use any kind of paint. This is a somewhat environmentally friendly paint and has very little odor. It is low in VOC’s (volatile organic compounds), and this makes it less unpleasant to use. There is a little bit of confusion when you first look at this can. It is called “milk paint,” yet the can says also says that it is water-based. The answer is very simple. Many people have not heard of milk paint, but it has been in use for hundreds of years. Milk paint is a natural paint made from milk, lime, pigment, and water. Since water constitutes the majority of its volume, it is still a water-based paint even though its formula is also milk-based. The main advantage of milk paint is the fact that it is totally non-toxic. It has often been used to paint things that will come into contact with small children or animals because of this feature. Milk paint is also very long-lasting and is one of the most long-lasting types of paint known to exist. We know this because archaeologists have confirmed that this paint can last for centuries if properly made and applied. One of the best things about this paint is the huge variety of different colors in which it comes. Unlike some of the other paints on my list, this one offers bright colors, dark colors, muted pastels, and simple whites and blacks. This makes GF milk paint one of the more well-rounded paints on our list. This paint also requires no primer or topcoat when used on wood. You can apply it to bare wood with no worries. This is great for rush jobs, and let’s not forget that time is money. However, milk paint is known to be less adhesive on smooth surfaces. This isn’t a huge problem for us because wood is not a completely smooth surface unless it is coated with another substance. Milk paint should work very well on anything made of wood and should last a long time. This is another winning product from General Finishes, where we can see their take on the classic “chalk paint.” If you don’t know, chalk paint is the thick stuff that you most often see on antique furniture. It is still very popular for painting wooden furniture of all sorts because of its wonderful opacity. “Opacity” is a fancy way of saying that chalk paint produces a surface that you cannot see through at all. The rich tones that are possible with this kind of paint were preferred by many furniture makers in the past, and some still use them to this day. This kind of paint has the advantage of being very quick to dry. This paint is usually dry to the touch within 2 hours, which is pretty good. However, it does not create a particularly durable finish. Even the advertising will tell you that this paint is not suited for outdoor use, although they note that you can use it outdoors if you want an “aged” look. This is also somewhat thin paint, but one good thing about that is the fact that you can spray it from a paint gun. It is compatible with virtually any paint gun on the market, including those that use compressed air and those that are airless. Chalk paint is not a gloss paint, so don’t expect that. This paint almost always produces a matte finish, which is why they call it “chalk paint.” In case you’re wondering, this paint does not contain chalk. It is named for the surface look that it provides. Another excellent feature is the mixability of this paint. GF chalk paint can be mixed with any of their milk paints. This gives you a lot of room to experiment and test your creativity. By combining these two types of paint, you can potentially increase the durability of chalk paint while increasing the opacity of milk paint. Of course, it will probably take some trial and error to get it just right. I would recommend starting with a 50/50 mix (by volume) and modifying from there as desired. 14. Rust-Oleum Specialty Chalkboard Paint – Your Kids Will Love It! This is a special-use paint that offers a unique and interesting functionality. Using this paint, you can put a clear layer over any surface. This layer will be all but invisible to anyone who isn’t specifically looking to see. However, this layer functions as a transparent blackboard. Blackboard paints have existed for a long time. They allow you to transform any surface into a functional blackboard that can be written on with chalk. However, this product takes it to a whole new level by allowing you to do the same thing with a clear surface. This means that you can paint your walls or your wood furniture with this stuff, and you will then be able to mark on them with chalk and easily erase the results with a soft eraser. Of course, a special-use item like this isn’t going to appeal to everyone, but it might be particularly useful for people who have a lot of kids. If you can’t stop them from writing on the wall while you are away, just put some of this on the walls and let them draw as much as they want. This paint works on a variety of surfaces including wood. The paint itself is mostly composed of latex, which is great because it is non-toxic and easy to clean up with soap and water. That being said, some people have allergies to latex, and this product definitely wouldn’t suit their needs. This is some of the most fast-drying paint that I have seen, as it dries to the touch in only 30 minutes. This is great for those with impatient children or for those who are just too busy to invest a lot of time in something like this. However, don’t get confused. The surface will not be fully cured for another three days. When the three days have elapsed, this paint will have formed a hard and scratch-resistant surface. You will then need to condition the surface by rubbing it with the edge of the chalk and then erasing. The surface will then be ready for use. Rust-Oleum is a very trusted name when it comes to paint, so that puts a couple of points in this product’s corner. They have often been known for making some of the most innovative and interesting paint on the market, and this one is no exception. If you haven’t heard of her before, Annie Sloan is legendary in the art world, specifically because she has been so influential in leading the movement to repaint and renovate wood furniture instead of discarding it. While Chalk Paint is now a somewhat universal term used by brands of all kinds to distinguish a type of paint with a smooth, thick finish that is easily applied and easily “distressed,” Annie Sloan actually invented the original Chalk Paint in the 1990’s! Each color is chosen by experts to reflect current trends, from bold hues to muted, soft pastels. The velvety, matte finish adds new life to your project, whether that’s a wooden dresser, a dining room set, cabinets, floors, walls and more. Like some other paints on this list, Annie Sloan product works well with wood, metal, concrete, plastic, ceramic, glass and more! It’s water-based and non-toxic, so it can even be applied to your dog’s house or baby’s crib. It is incredibly easy to use-no sanding or priming required with this paint. While Sloan recommends you apply it with one of her signature brushes. The quality is so high, it is evenly applied with even the most inexpensive of synthetic brushes. The paint is extremely versatile; add water to dilute it and create a stain or use a speckled brush to achieve a look on your walls with more texture. The possibilities are endless with this high-quality product! As seen in many of the options above, to achieve the best look, there is a process that must come before painting any wood. Though some products include a primer, most advise that you sand and finish wood before it is painted. Why? Let’s walk through the process. Hair, dust mildew and other particles can get mixed up in your paint. This will cause visible blemishes, bumps and imperfections. Washing down the wood with mild soap and water or tri-sodium phosphate (found at your local hardware store) will save you from future headaches. Even if the wood came from a hardware store, sand it down with a 180-200 grit sandpaper and then wipe off the dust with a cloth. Sanding the wood gives the paint something to attach itself to. Primer chemically bonds to problematic areas of the wood and gives the paint an even surface to rest on, so that the end result is more uniform. I’ve put together great primers for wood so that you can pick up exactly what you need. After applying primer, lightly sand the wood one more time and wipe it down. Now, you are ready to start painting. Remember if you’re painting wood which is going outside make sure the paint has a built-in sealer or add a sealer once the paint is dry. While many paints say that they include a primer, be wary about skipping all of the steps above before applying, even if it is high quality. While washing, sanding and priming the wood can be time-consuming, each step gets you closer toward your goal of having a project that is painted in the most professional manner and ensures the longevity. Ultimately, decide what kind of paint to purchase based on what you are painting, where it will live (indoor or outdoor), how much time to have to complete the project and what color and finish you want the project to have. The great projects are those that keep their beauty with minimum maintenance. I’ve got an old unfinished wooden dresser in my bedroom which I and my wife want to be painted grey. This is my first time painting anything so I’m really afraid of spoiling the furniture. I’m looking for paint which is designed for interior wooden furniture and is quite easy to apply (even by a newbie like me). Having read your article I got that Renaissance Paint and Rust-Oleum Chalked Interior are the best options but for me, those are pretty much the same. Both have many colors, easy to apply, minimal preparations and both are intended for interior use. I’m really confused. Which one would be a better option? Also, it would be wonderful if you briefly tell me steps I have to follow to paint my dresser properly. Sorry, just do not want to totally screw up the dresser. Thanks. Hi Sam. It’s okay, I understand your concern. Actually, these two options are pretty similar, both products got high quality. Choose any, you will love the results. Do not overthink it, just pick up Renaissance. Then sand the primed dresser after it dries. Now you can start painting, two coats will be enough. Sand again after the first coat of the paint dries. Finally, apply the second coat. Believe me, it’s much easier than it seems to be, just take the first step. Hi good article. I need the best exterior wood paint, I read your article and now I’m choosing between kilz and rustoleum. What’s the better choice?.. Hi, Michael. First of all, there are Rust Oleum paints on the list that are not to be used outside. You could pick up multi-purpose latex paint or Premium latex paint but chalk paints are only for interior use. Furthermore, I need to know what you are trying to accomplish exactly to give you some advice. If it’s something like pressure treated wood, decks or patio that experience a lot of traffic then I definitely recommend KILZ porch. I’m afraid no other option on the list could provide such great protection for pressure treated wood as Kilz do. If you’re going to refresh thing which got a large area such as siding, barn or fence then choose KILZ exterior siding. It’s made especially for these kinds of projects. By the way, if you haven’t known yet I will tell you that you need to prime the project before you paint it to hide spots and make the paint stick to the surface more evenly. But Kilz exterior is self-priming so you don’t need to waste money to buy a gallon of primer to prepare you siding. Okay, KILZ options are great to paint large projects that require great durability and longevity. On the other hand, KILZ will be excessive if you’ve got something like an outdoor chair, table or some little piece made of wood. In this case, Rust-Oleums are much more appropriate options. Furthermore, KILZ goes with gallon sizes which I think you will find excessive for a moderate project. So Rust-Oleum latex paints are great for outdoor furniture. Bear in mind that all Rust-Oleum latex paints require wood to be sanded before painting using 180-200 grit. I want to refresh my old vintage light wooden dresser so I’m seeking for interior paint for furniture. Rust Oleum seems to have many great options but I can’t decide what will be better: spraying or brushing? For me, both these alternatives seem pretty the same but I may miss something crucial. Looking forward to hearing your opinion, thanks! That’s a great project you’ve got. Refinishing vintage furniture is an interesting process which leads to a beautiful wooden piece, you will love it. You are right; both methods are suitable for your situation. Let me explain spraying first. 1. It’s a good option if you got little time since spraying is much faster than applying paint with a brush. 2. Another important moment is that you will get a smooth layer of paint free of brush strokes which you may find unacceptable. 1. It’s harder to get an even layer of paint. You may get it too thick in some areas. And to fix it you will need to add additional paint to the areas lacking thickness. 2. Adhesion while spraying is not as good as while brushing. In this case, you will need more preparation before painting namely sanding the surface thoroughly to increase the adhesion. 3. It’s better to spray your project outdoors or in a well-ventilated area. If the only option you have is indoors then I highly recommend you to use a respirator. 1. Better adhesion. Unlike spraying, brushing requires less preparation. Some brands may be brushed even without sanding. 2. You can apply paint more evenly because controlling brush is easier than a sprayer. So I described objective moments. Actually, both methods are nicely suitable for your project… but I personally think that painting vintage furniture should be done via brushing. Why? You see old vintage furniture has a special look and meaning and I think spraying it is boring, it deserves something much more interesting and extraordinary. That’s why I prefer brushing vintage pieces rather than spraying. Most of the time, brush strokes are undesirable, but in this case, they play a big role in making the vintage furniture looking even more vintage. A smooth layer of paint is just so dull and tedious. After brushing you may distress the surface to make it look even older. That’s how I think a vintage wooden furniture piece should be refreshed. For this purpose, Renaissance Chalk Furniture Paint or Rust-Oleum Chalked are the best choices. Hi there! Last October I painted my fence gates with Behr exterior. I liked the results, so far paint looks great, there are no peelings off or rives. I want to paint interior stair rails this spring. I have a half a gallon of Behr left over and I wonder if I could use it to paint the rails. Or maybe I need to buy another tin of paint, especially for the interior? Your answer will be very helpful. Nice to see you on my blog, Chris. Basically, you are right. Purely exterior paint should not be used for interior uses. I’ve never used Behr brand but if it says that it’s intended only for exterior then use it only for the exterior. Exterior paints designed especially for outdoor to resist harsh weather conditions: aggressive sunbeams, wind, heat, cold, moisture etc. Exterior paint has to ‘soft’ so that it can enlarge/shrink depending on temperature outdoors so if you use it inside you will get a little bit tacky surface. Furthermore, exterior paints have harsh chemicals and strong odor (since they have to deal with the weather as I mentioned) which will stay in your house for a long time, much longer than interior paints that often got no odor at all. And what I find the most important is that some exterior paints may outgas which means you will breathe polluted air on a daily basis. So each paint’s recommended to be used for certain conditions whether exterior and interior or even both. If you want to break the rules then at least contact manufacturer to make sure you’re doing it in a safe manner. Moved into a new house a couple of weeks ago, there’s a shabby lovely wooden table in the living room. It’s totally unfinished and I suppose it’s never been. The former owner told me that the table’s made of satinwood. Actually, I’d like to finish it (namely to paint) since it’s kind of faint. Could you please recommend some decent satinwood paint? Or maybe there’re other kinds of finishes that are more appropriate for satinwood. Appreciate. Satinwood is one of the most beautiful woods. You see since I started practicing wood finishing and woodworking I’ve done a satinwood project only once. I was a tall cupboard made mostly for decorative purposes. We finished it with lacquer and it turned out to look just awesome. So, based on my personal experience I can say that using some clear satin or gloss finish would be more preferable in comparison with paint. In my opinion, satinwood got nice shade and grain by itself, there is no need to paint it, I’d rather use lacquer or oil to protect the wood and of course, give it a satin look. 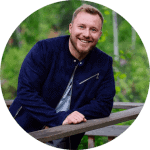 There’s a great article about oil brands you may take a look at https://woodimprove.com/best-oils-for-wood/. I don’t really think that painting your table is a good idea. But that’s just subjective opinion of mine. Anyway, if you really want to paint your furniture then I’d suggest using some satin/semi-gloss option such as Rust-Oleum Satin or Latex, I’m afraid chalk matte isn’t the best choice in this case. Get a good bristle brush, fine grit sandpaper and you’re ready to go. Rust-Oleum paints are easy to apply so your project won’t be a big deal. So, I hope you will decide which is better for you. whats good brand for painting indoor floors? Hi. KILZ floor paint is the only option for painting floors on the list so far, you can surely use it to paint interior pressure wood. Nice product, the only blemish of this paint is that it’s got only a couple of colors so if grey shades are not appropriate for your floor then you should seek for some other options on the market. Hi there, William! I and my husband are doing a renovation of my grandma’s apartments. We’ve done a lot so far, there are only trims and doors left. The oak doors are quite aged: the paint’s cracking and fading. Now we’re wondering how we could refresh them. What paint for wood doors could you recommend? And how can we apply it properly? Hi, Debra. I’ve painted different types of interior and exterior doors using different paints so I’m glad you asked me. I’m sure that kind of paint, as well as gloss, doesn’t really matter a lot here: chalk, latex, acrylic… all these could be used to get nice results, it all depends on your general apartment design. For example choose one which fits the color of the walls, whatever you want. If you want matte surface then choose chalk product such as Renaissance or Rust-Oleum Chalk. For satin or semi-gloss choose latex options. And, of course, you have to use only paint designed for interior, we don’t want your grandmother to breathe chemicals of exterior paints, I mentioned it earlier in one of the comments above. Painting door is harder than choosing paint thought, but it’s pretty simple at the same time. Take your doors off hinges, remove hinges and handles. Then remove existing paint using paint stripper or any mechanical tool. Use putty to fill wood crack, then sand using 180-200 grit sandpaper. Now I highly recommend you to prime your door: by doing so you will save initial paint color and hide any wood blemishes. This article will help you the best wood primer for you, as I recall KILZ Original is pretty good options for wooden doors https://woodimprove.com/best-wood-primers/#product6. Then finally paint the door, you can do it very quickly using a roller. Use brush to paint hard-to-reach areas. Feel free to contact me if you’ve got any questions left. Love your article, William. I want to paint my outdoor bare wood table, but the problem is I’m living in Mobile. It’s very rainy town so I think protecting the table against moisture is a good idea. Unfortunately, I haven’t seen any waterproof brands on your list. Can you please tell me if there are waterproof paints for wood I can use? Thank you in advance. Thanks for your question, Mila. Actually, all paints designed for exterior use withstand moisture well. I can definitely say that chalk paints are not the best choice for waterproofing, therefore, they are used for painting interior furniture mostly. Exterior paint kind of seals the wood by itself so in most cases, you won’t need any additional wood finish to protect wood against humidity. But for you, I think using some top coat wouldn’t be a bad idea. I think using a sealer will be the best solution here. Sealers are specially designed to protect wood against the moisture, mold and rotting particularly exterior wooden protects. So if the only thing you need is waterproofing then sealer is a ‘must have’ for you. Several months ago I wrote the article where I listed top sealers on the market in my opinion https://woodimprove.com/best-wood-sealers/. I think Agra-Life Lumber Seal will be a great choice for you. Remember that sealers work better when applied over water-based paints. Also, it’s worth mentioning that you will need to refinish your table each 6-12 month depending on weather and utilization conditions. Of course, you may apply something more durable like polyurethane but I think it will be redundant. So, sand your table using a fine grid, then prime it (choose one of the water-based primers here https://woodimprove.com/best-wood-primers/). Then paint it preferably using water-based paint. Wait for it to fully dry and finally apply a couple of coats of wood sealer. Hope, you will be pleased with the results. What a great article, love it! Looking for paint to refresh my white kitchen cabinets. I see that Nuvo brand is designed just for that purpose but it’s got only 2 faint colors… Disappointing. I’d like some darker color like dark grey, brown. What would be a good substitute for Nuvo??! Thanks for help! Hi, Ava. As you already mentioned, Nuvo is perfect for cabinets. Yes, there are only two pale colors, but they set calming, gentle ambiance. Also, Nuvo is more durable paint since it’s intended for high traffic surfaces like cabinets. Anyway, if you want more color then I suppose Renaissance paint will be a good choice: there are plenty of colors and it can be used to paint cabinets. Remember, Renaissance isn’t as traffic resistant as Nuvo, so you’d better use clear top coat like polyurethane to protect your work. See my list of the best polys out there https://woodimprove.com/best-clear-coats-for-kitchen-cabinets/. Very helpful, I found exactly what I’ve been looking for!!! Thank you very much, Donna. I’m glad you found the article valuable. Appreciate.